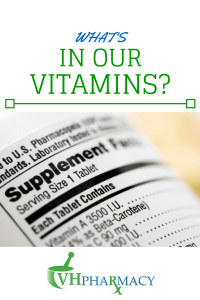 Ever Wonder What’s In Your Vitamins? I recently had a very thought provoking conversation with a client. She mentioned she had started taking a cocktail of weight loss vitamins she purchased from a well-known health and nutrition retailer, but was frustrated over the lack of results. I know my client is not alone. Many of us take vitamins and supplements for energy, weight loss, overall health and to fill in the nutritional gaps in our diets. I certainly agree vitamins and supplements can be beneficial in a stressful twentieth-century lifestyle. Unfortunately, you may not realize what you’re really buying or what’s in your vitamins unless you read and understand every label. With vitamins and supplements, as with everything else, there are some that are better than others. The fact is most vitamins sold in grocery stores and by big box stores are in synthetic forms with a long list of unhealthy and toxic ingredients. Manufacturers use such products to make them easier to swallow, faster to produce and more eye-catching. 1) Synthetic vitamins are typically listed on ingredient labels by their isolated names – ascorbic acid (vitamin C), riboflavin (vitamin B2), and dl-alpha tocopherol acetate (vitamin E). Unlike natural vitamins found in foods, synthetic vitamins are produced in a laboratory, and may be derived from toxic sources such as coal tar and petroleum. 2) Magnesium stearate is an additive found in many supplements, including those made by more reputable brands. This ingredient, over time, can actually block the absorption of nutrients into your body, and regular consumption of it is linked to the development of a harmful biofilm in the intestines that may cause digestive problems. 3) Titanium dioxide is often used as a pigment in vitamins and supplements, and has been linked to autoimmune disorders, cancer, and various other diseases. 4) Artificial colors like blue 2 and red 40, which are potential neurotoxins, are present in many mainstream supplements and children’s vitamins. 5) Genetically-modified organisms (GMOs) are any organism whose genetic material has been modified using genetic engineering. If your vitamin or supplement formula contains ingredients like, maltodextrin, citric acid, dextrose, vegetable-based fillers, sugars of any kind or ascorbic acid, chances are it also contains GMOs. ABOUT VH PHARMACY: VH Pharmacy is a family-owned and operated neighborhood pharmacy. In business for more than 40 years, VH Pharmacy has been under the leadership of Pharmacist Eddy Blanco for the past 11 years. With his extensive knowledge of pharmaceutical compounding, Eddy Blanco has transformed VH Pharmacy into a technologically cutting-edge facility. To learn more about our services, please visit our website at www.vhpharmacyrx.com or call us today at (305) 324-8777.